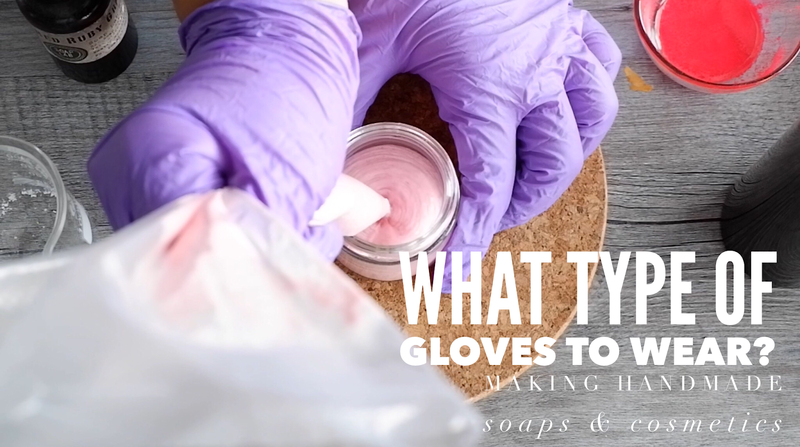 SoapLab Malaysia: what type of gloves should i use when making soap & handmade cosmetics? what type of gloves should i use when making soap & handmade cosmetics? Heres an interesting question i got asked lately: wether to use powdered or normal gloves when making handmade cosmetics. But before i answer that question; lets find out first why we need to wear gloves at all when making cosmetics and soap. The reason why we wear gloves is to make sure that the ‘dirt’ from our hands (sweat included) doesnt go into our cosmetics. Gloves ensures that bacteria or any other microbes on our skin doesnt get into our handmade cosmetics so that the cosmetics have a longer shelf life. Besides that; if you are making soap using lye: gloves will protect your hands from the lye. Lye usually get ‘hot’ when it touches water (or if it touches your hand: your sweat). It heats up to almost 100 degrees when in contact with water or any liquid. This will then ‘burn’ your hands. Besides its also highly corrosive alkaline. Therefore its safer to use gloves when in contact with lye. Which type of gloves to use? You can use any gloves as long as they are sterile. Usually if you are using those disposable gloves; your gloves are already sterile: therefore you dont have to sterilize it anymore. If you are using those that are non disposable ones like the latex gloves (usually for gardening) those you will have to sterilize it first before using. The easiest way is to spray it with rubbing alcohol before you use it. Its prefarable to use those non powdered ones. Powdered gloves are for those who sweat a lot. However; when you use the powdered ones; there are chances of it getting into your cosmetics and it can get a bit ‘messy’. So if you have an option: get the non powdered ones. This depends on your skin. If you are someone who is allergic to latex (yes there is such thing! ); use the plastic ones. But if you are ok with both; get the latex ones simply because its more comfortable. You can purchase it at any pharmacy (latex) or bakery supply store (for those plastic ones).